Have you ever wondered why we do the things we do? In writing this story, I am thinking that there may be something greater than ourselves that directs us when we don’t have a clue as to what we are doing. Nobody seemed to understand why two people, born and raised in downtown Toronto, would choose to do things in this unconventional way… neither did we! 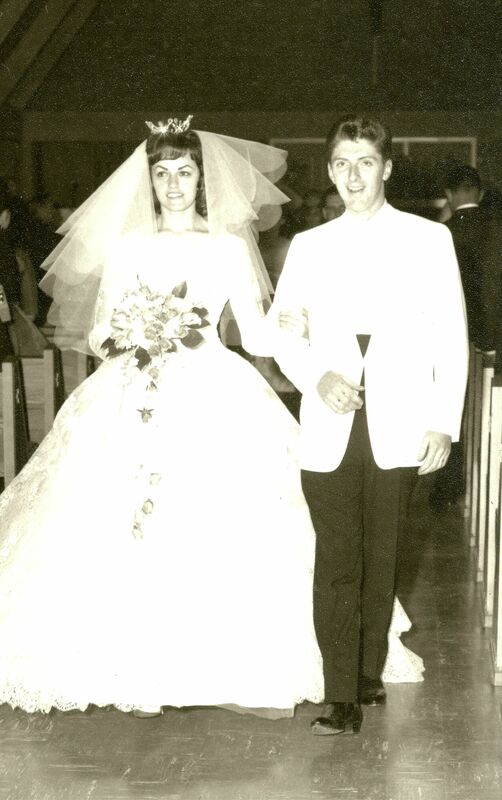 Jim and I were married October 5, 1963, one month prior to my 19th birthday. Jim was twenty-two. We rented a one bedroom apartment on Lakeshore Road in Port Credit for ninety dollars a month. I worked at The Bank of Commerce in Toronto as an IBM key punch operator. Jim was an auto mechanic at Hawley Motors in Mississauga. Every weekday morning on his way to work Jim would drop me off at the train station in Port Credit and pick me up on his way home. Jim also sang and played guitar in a band. After touring many properties in the Georgetown and Milton area, we were shown ten acres that seemed affordable in what is now North Milton or Nassagaweya. Jim's band manager, Murray Cranston, who also sold real estate, showed us the property in December of 1963. It looked beautiful covered in snow, cedar trees and rocks. We used the money received as wedding gifts to make a down payment and continued to pay off our property over the next year. Jim’s salary paid for our apartment and living expenses in Port Credit, while my earnings paid the balance owing on our property. In the spring, when the ground thawed, we realized what we bought was a lot of work. There were cedar trees and rocks completely covering the property. Not a single clearing on which to build a house. My grandmother drove out with my parents one day to see our country property and thought that we had lost our minds. Shaking her head in disbelief she said, "Only Indians live out here!" and asked, “Is there electricity out here?” and “What if you decide to have a family, are there schools in the area?”. We didn’t know and had not even thought that far ahead. The optimism of youth! 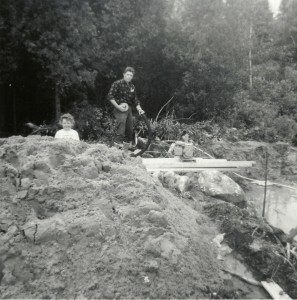 Over the next five years, Jim would work all week in Mississauga and I would work all week in Toronto, then we would drive out to our property and cut down trees all weekend long. Staying in an old truck body that Jim’s father, who was in the trucking business, gifted us to make our weekends a little more comfortable. One night I awoke at midnight feeling very sick to my stomach, this continued over the next few nights. I decided to see a doctor, he did some tests and when the results were in he called me to his office and told me that I was pregnant! I drove directly to see Jim at work to let him know. We were very excited and at the same time relieved that I didn’t have the flu or something worse! As a precaution in my second trimester, my gynecologist advised that I stop taking the train to work. I got a job closer to home for a couple of months, to help make ends meet. In my third trimester, my doctor advised me to quit working altogether. There was no maternity leave back then. We decided to give up our apartment and move in with Jim‘s parents. Our daughter, Dawn, was born February 12, 1965. When things settled down a little, we decided to move out on our own again. We managed to find an apartment in Streetsville, near Applewood Motors, where Jim was now working. 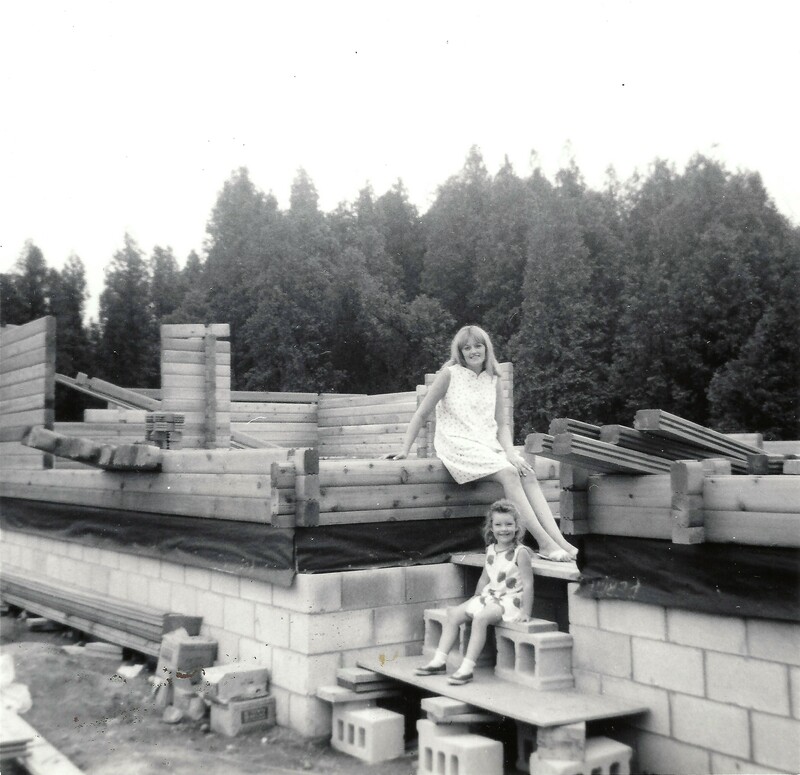 While living in Streetsville, we looked around at different types of houses to build on our land and discovered a Pan Abode red cedar log home, manufactured in British Columbia. It would cost us sixteen thousand dollars to buy the logs, windows and roof to build our home. We then had to convince a bank to loan us the money, offering our paid property as collateral. This proved to be much more difficult than we could have guessed. The Toronto Dominion bank manager in Streetsville, where we lived and banked, told us that we could never afford to pay it back and declined our loan. Finally, we found a lawyer who was willing to take a gamble on two young dreamers. He offered us the sixteen thousand dollar loan at a nine and a half percent interest rate. We accepted and my parents co-signed the loan. 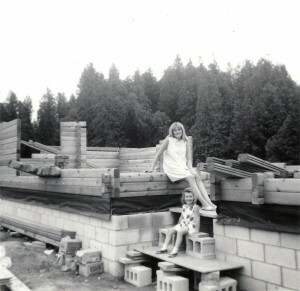 We ordered our house and agreed to take delivery the summer of 1968. At this point, I was staying at home most of the time, looking after our daughter Dawn. Jim was offered a job teaching Automotive Technology at Port Credit Secondary School. In order to fulfill the requirements for this job, he had to attend Teacher's College for a year. We moved back in with his parents. Friends and family offered to help cut down trees. It seemed everyone wanted to be a lumberjack! Weekends were like camping out. We cooked pancakes for breakfast and hot dogs for lunch on an old wood stove we dragged in from somewhere. Occasionally, we would stay overnight, sleeping in the old truck body with an attached, poorly constructed, guest quarters. This was quite an adventure for a city girl. One day upon arriving at our shack, we found a five foot long snake had taken up residence. Jim was not a fan of snakes, but managed to drive him out… my hero! Our team of lumberjacks enjoyed every minute of the outdoor life. Some of Jim’s students found out about our adventure and asked to get into the act. Jim showed them how to use axes and chainsaws! Trees were falling every which way! Thank goodness nobody was hurt! We did not even consider the liability. We cut down only enough trees to make room for a house and small barn, leaving a twenty foot border of cedars around the front and sides for privacy. The rest of the acreage was left to nature. 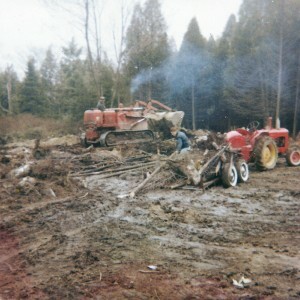 Jim built a boom truck to pull out the stumps. We hired Nellis Construction to come level the land of stumps and rocks. One day as we were driving toward our property, we noticed signs all along the road stating “CAUTION, HEAVY TRUCKS TURNING.” I commented, “WOW, someone is having a big project done around here! Much to our surprise, the dump trucks were turning onto our property! Could we afford this? …Yipes! It turned out that Nellis Construction was doing road work for the Town of Milton and needed somewhere to dump fill! … We paid only three dollars a load. Now it was time to think about building our house. Jim’s father knew someone, from his Legion, who could put in the foundation for our home and my father knew a man, who was qualified by Pan Abode, to assemble our log home. It was the spring of 1968 when we started digging a foundation. Every time the front end loader dug into the ground it hit a spring. We were advised to dig only a shallow hole and built mostly above ground, which we did. After the footings were poured our foundation kept filling with water. Every weekend we pumped it out and it would fill in again during the week. We eventually installed a sump pump which ran continuously. All was approved by the Town and we continued our optimistic quest. 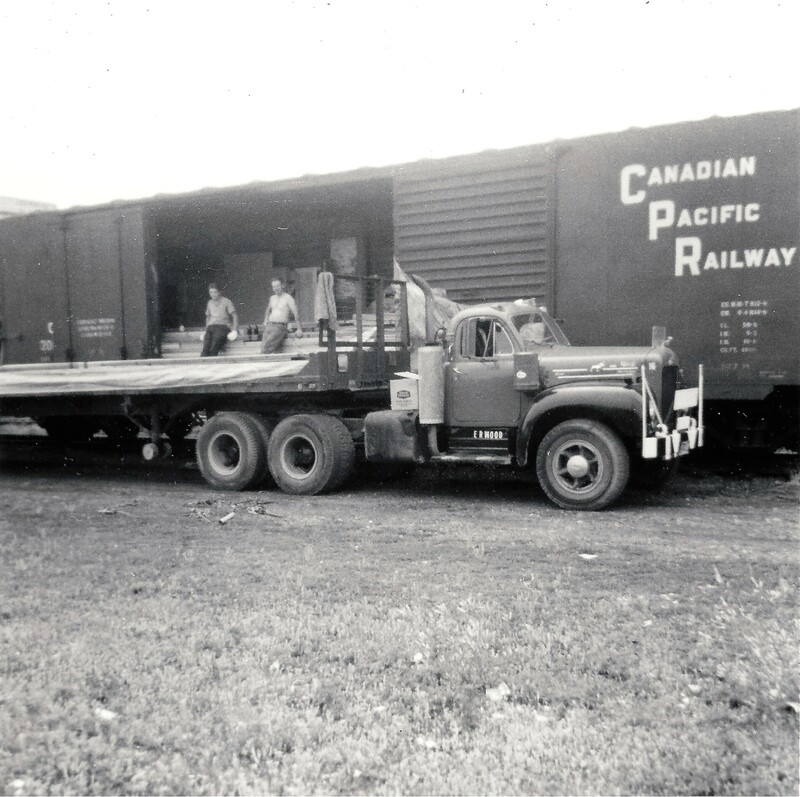 In July of 1968, our Pan Abode red cedar logs arrived from British Columbia via Canadian Pacific Railway. Jim’s father and a friend, Ed Wood, came to our rescue with tractor trailers. Friends and family lifted each log off the train, loaded it onto the trucks and hauled it to our building site in Nassagaweya. teacher, Jack Irwin, constructed our kitchen cupboards, in his shop at home. The metal shop teacher, Carl Ingles made us wrought iron doors. Our brother-in-law, Claude Stevens, who was also a shop teacher, designed our heating system. We hired an electrician to drill through each log as they were being installed for light switches, lights and plug wiring. Mrs. Sproul witched our property to find water and her husband drilled our well. The sewing skills my grandmother and mother taught me came in handy to make curtains and bedspreads. We could not afford carpets or proper flooring, so I painted our sub floors with big flowers. We moved into our home just in time for our daughter, Shari, to be born on November 27, 1968. Jim’s next project was to build a makeshift barn to house horses and fulfill his dream of being a cowboy. 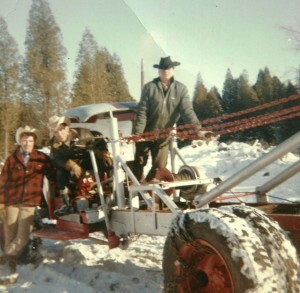 His father bought a couple of draft horses to keep in our barn, and a friend, Cliff Tunney, boarded his horse here as well. We bought a few chickens, cat and a dog. We also planted a garden, which did not grow very well. What did grow was quickly claimed by raccoons and other wildlife. We found out later that in order to grow vegetables, we had to add lime to the soil to make it more alkaline. The cedar trees had made the soil too acidic. Much to my grandmother’s surprise, we were not attacked by Indians, electricity was available and there was a school for our daughters to attend. They travelled by bus to Brookville Elementary School, and later attended Holy Rosary in Milton. We even had telephones... , but with a multi-party line. 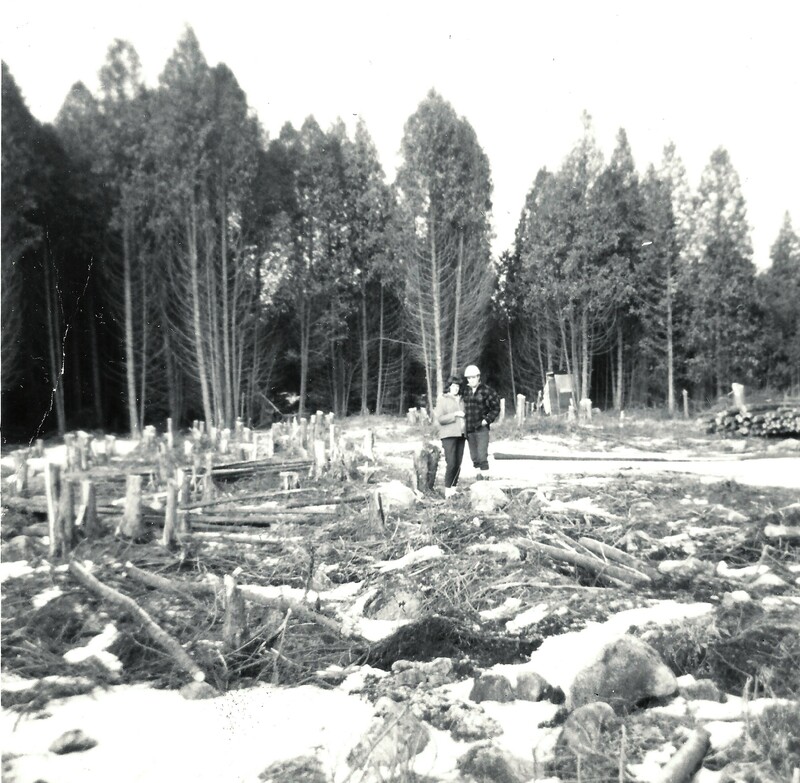 A few years later while raising our daughters, I convinced Jim that it was a good idea for us to buy another seventeen and a half acres of land which adjoined our ten acre property and start a tree farm for lumber. 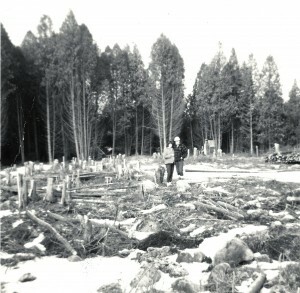 The Ministry of Natural Resources planted nine thousand native white pine and white spruce trees on a clear ten of the acres toward the back of our property in 1979. I put that ten acres and another twelve under agreement with the MNR, agreeing never to clear cut, and to submit a professional “plan” every few years. Much of the land is environmentally sensitive. It contains swampland, a peat moss bog, a natural spring, and many rare species of flora and fauna. The Ministry of Natural Resources suggested ways to maintain our tree farm and contacted Guelph Correctional Institute to set up a plan to bring inmates to work on our property harvesting some of the cedar trees. 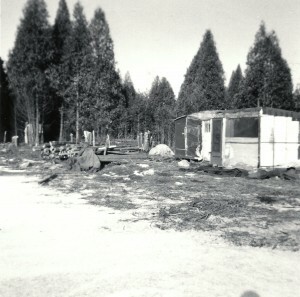 The Ministry marked certain trees and the inmates cut them down, taking trees of a certain circumference back to prison where they made picnic tables. Three inmates escaped while working here. The guards did not carry guns, because they told me that it would make things more dangerous. They did not even have cell phones back then. When the first inmate escaped, the guard knocked on our door and asked to use the phone. He had the police and helicopters surrounding the area in no time at all. The inmate turned himself in, he did not go far. The other two escapees were also quickly apprehended. We entertained often having corn roasts, snowmobile parties, horse drawn sleigh rides and dances on our outside deck; Jim’s band performed. It was a busy life, with Jim teaching high school and me teaching modelling and self improvement at Finishing School. I later worked for the Ontario Jockey Club as their official hostess, model, and in publicity, looking after groups. Jim would arrive home for work and look after our daughters and I would be ready to leave for work, evenings and weekends. Over the years, we added a two story barn, built a three car garage, drive shed, a garden house and two additions to the main house. We also did a lot of landscaping. Continuing to reside on our property in Nassagaweya, we maintain our tree farm, but no longer have animals. Our daughters are married and own their homes. We enjoy having our family nearby and have four wonderful grandchildren. Jim now teaches guitar and has a guitar club at the Milton Seniors' Centre. He also sings in a band called "Late Harvest". I do some writing, art work, and volunteer for work for the Town of Milton and for the Chet Atkins Society in Nashville, TN. … and so the story continues.